St. Louis Park senior forward Tyler Broderson is a star on the baseball diamond as well as on the ice. While splitting practice time between the grass and the rink in past years, the team captain still had enough energy to lead the Orioles in scoring during his junior year with 37 points. This offseason, however, Broderson ditched the baseball for a puck and the results are showing in the stat columns, as well as the win column, for undefeated St. Louis Park (6-0-0). “This summer I kinda made a commitment to wanting to play college hockey and putting my efforts into that full time,” he said. Broderson scored two goals and added an assist in St. Louis Park’s 8-1 pasting of St. Paul Academy on Tuesday, Dec. 20, giving him 21 points in the Orioles' six games. During summer break, Broderson made it a priority to prepare for hockey, putting in time with new coach Shjon Podein and other assistant coaches. He also skated for the Edina Lakers, a member of the Minnesota Junior Hockey League. The extra practice has boosted Broderson to new heights, and he has relished his role as a scorer. In the Orioles' win over the Spartans, Broderson made his biggest impact in the first period when he cut across the middle of the ice and ripped a shot that found the top corner of the net. His 13th goal of the year pushed the score to 2-0 and drained a lot of the Spartans' energy. Podein said despite Broderson’s obvious talent, skill is not all Broderson brings to the table. The Orioles have benefitted from Broderson’s decision to stick with hockey, and their undefeated record has been the biggest payoff. “He’s leading our team in the direction we want to be going,” Podein said. Shjon Podein has had a wonderful beginning to his first season as head coach at St. Louis Park, leading the Orioles to a 6-0-0 record, including Tuesday’s 8-1 drubbing of St. Paul Academy. As the new face of the program, Podein has turned around a team that went 3-22-0 last year into a dangerous squad that has averaged six and a half goals per game, while only allowing one and a third on the defensive end. “We’ve really raised the expectations of what we had on this team,” Podein said. “These kids, they not only grabbed for it and ran but they drooled for it, they craved it. I think that’s a big difference in why you see them having success together as a team." Senior captain Tyler Broderson has enjoyed success under Podein and noted after the game the differences since Podein took over. Day-to-day there have been big changes as well, Broderson said. The practices in particular have been quite the change of pace. “Everybody comes to them with the attitude that it’s harder than a game. You work harder in a practice than you do in a game, and that makes the games ten times easier,” he said." One of the biggest successes so far in Podein’s time at St. Louis Park has been the ability to inject fresh, top-notch talent into his roster. His presence was definitely a selling point to young players such as star freshman Josh Passolt. For Passolt, the chance to play for Podein was too good to pass up. Even though he was being recruited by other schools, he said Podein was the biggest influence in his final decision. Passolt and eighth-grader Alec Baer have combined for 18 points so far this season, five of which came in Tuesday’s win against the Spartans. The two are part of three consistent Orioles lines, all of which are scoring threats. For veterans like Broderson who had to persevere through last year, the program's undefeated streak has been the best part of Podein’s short tenure. Freshman year for a hockey player is supposed to be one filled with growing pains, small contributions, and most likely some time on the junior varsity squad. Josh Passolt decided to bypass all of that and skip to the good stuff. After Tuesday’s 8-1 win over St. Paul Academy, Passolt is now second on the team with 14 points after scoring two goals and assisting on another. His eight goals are three more than his closest follower, and only senior captain Tyler Broderson is ahead of him. The Orioles feature many youngsters this season, but so far Passolt has been the cream of the crop. The step up hasn’t always been as easy as the stat sheet makes it look. Passolt has been working on getting stronger and being more physical to combat mismatches due to his age, but sometimes it just comes down to effort. Podein has appreciated the work. “When you have a player like that that you can throw in the lineup in a nightly basis right now and get production out of him and count on him acting more like an upperclassmen than a lowerclassmen, it makes a big difference with your team." 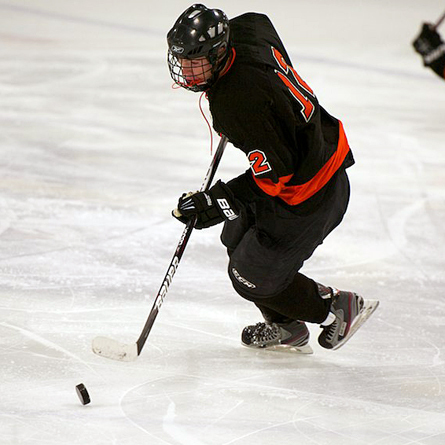 St. Louis Park pushed around St. Paul Academy in an 8-1 victory on Tuesday, Dec. 20 at Drake Arena in St. Paul. The Orioles offense imposed its will, racking up 31 shots and dominating the game from the word go. Eighth-grade forward Alec Baer set the tone for the Orioles (6-0) when he received a pass on a two-on-one rush from freshman Josh Passolt and buried the puck behind Spartans senior goaltender Jude Hull. St. Paul Academy (1-6-1) bounced back early in the second, when freshman forward Austin Ramirez picked a corner on junior goaltender Ryan Froom of St. Louis Park. Junior forward Peter Wood assisted on his goal. The momentum would not last however, and St. Louis Park scored five unanswered goals in the second period and glided through the third with the only goal of the period. St. Louis Park plays No. 7-ranked (Class 1A) Duluth Denfeld on Tuesday, Dec. 27, in the Duluth Heritage holiday tournament. The senior captain scored two goals and tacked on an assist in the Orioles' big win. His three points give him 21 (13 goals, eight assists). He is the team leader in both goals and assists and is a dynamic offensive force on the ice. He also led St. Louis Park in points last year with 37. The freshman forward was part of a stellar night for the young players on St. Louis Park. He tallied two goals and an assist and is now second on the team with 16 points, ahead of many seniors and upperclassmen. The lone bright spot for the Spartans, Ramirez, a freshman, netted a top-shelf beauty early in the second period that made the score 2-1. Although the tight score wouldn’t last, the goal energized SPA for a while. He now has two goals and four assists.